Received November 14, 2018; Accepted December 6, 2018. As explained by the subtitle “Science and Evolution of Reading,” “Reading in the Brain” is a book written by a world-famous cognitive neuroscientist of reading science. In the book, the author introduces to the general public the process of how reading science evolved and how the brain works when reading a book. The original text was published in 2009. 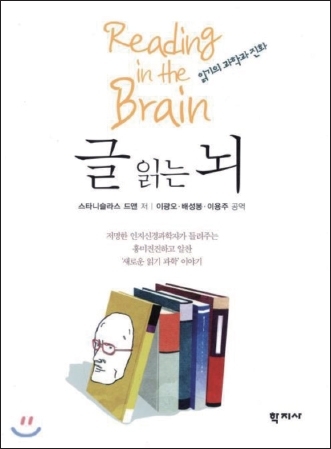 Its English title is “Reading in the Brain,” and its translation was published in South Korea a bit later in June 2017. Perhaps owing to strong recognition for the original text, it was selected as an Excellent Academic Book in the field of social sciences by the Ministry of Education and the National Academy of Sciences, Republic of Korea, on June 11th, 2018. The author of the original book, Stanislas Dehaene, was born in France in 1965, majored in mathematics in college and psychology in graduate school, and is working as the director of Cognitive Neuroimaging Unit in Saclay, France, and a professor of experimental cognitive psychology at the Collège de France, which is a French representative higher education and research establishment. He studied in the United States for a very short period in his background area, and as an erudite scholar who studied and researched mostly in his homeland, France is proud of him. As you can see from the book cover, he is reminiscent of Michel Foucault, a genius philosopher from the same country, as he has been bald from a young age. The representative translator is Professor Gwang-oh Lee who teaches psycholinguistics in Yeungnam University and is a cool old gentleman who is not bald yet. “Consciousness and the Brain” is a masterpiece that gives you a new insight on consciousness and unconsciousness, which are the ultimate interest of psychiatrists. Science aims for the “objective study” of actually occurring phenomena, but consciousness is too “subjective” to be a subject of science. Even psychiatrists simply figure out consciousness by subjectively interpreting the subjective experiences of patients. Hence, most scientists have thus far viewed research on consciousness as a permanent field of philosophers because the problem called “subjectivity” cannot be overcome. However, the author presented a hypothesis that investigates the true nature of consciousness through new creative experiments in the field of consciousness and is awaiting verification by younger scientists. He claims that “consciousness is information sent from inside the cerebral cortex to the entire brain,” consciousness is formed from the neural network, and the reason for the existence of the neural network is to share appropriate information through the entire brain extensively. As this concept, called “global neuronal work space” is newly presented, the fundamental nature of this work space is described as “autonomy.” Most of the results supporting such a conclusion are from his past studies on letter and number cognition. If to Freud, dreams were the royal road to unconsciousness, then to Dehaene, it is numbers. If you are a doctor starting out in child psychiatry, then I recommend reading his three groundbreaking works in the following order: reading-consciousness-mathematics (although there is no translation for the mathematics book yet). The New York Times review on this book was written by Alison Gopnik, a professor of psychology at the University of California at Berkeley, who is famous for The Philosophical Baby. On the two explanations on human nature, she comments that it is a study that provides support for the claim of the Noam Chomsky and Steven Pinker camp, not the Blank Slate (Tabula Rasa) camp. Chomsky believes that if aliens arrive and listen to the language of earthlings, they would think that earthlings speak the same language although with dialects existing. Dehaene claims that the ways humans learn language are all similar and not diverse, and cannot deviate from the limitation of the innate brain structure and function. He also claims that the ways to recognize letters are all similar because the part of the brain used to recognize faces or footprints is the one used via neuronal recycling, although human letters are diverse. The primitive brain is recycled when we learn new techniques like speaking or reading and the allowed range for change is very narrow. Such cognition provides an insight as to how students should be taught, especially slow learning students. Now, let’s have a look at the content composition of “Reading in the Brain.” Chapter 1, “How Do We Read?” starts by looking at “Reading” from the psychological perspective. Chapter 2, “The Brain’s Letterbox” moves further from psychology to talk about brain areas that work during reading. Chapter 3, “The Reading Ape” shows how the reading circuitry is composed at the single neuron level. His brain science research encompasses many collaborative studies on the patients of Laurant Cohen, a neurologist at the Pitié-Salpêtrière Hospital. The Pitié-Salpêtrière Hospital is famous as a hospital that managed the last treatment for Diana, the British princess. Ghislaine, Dehaene’s wife, is a pediatrician who researches language development in children; they married after meeting at a research center. Dehaene is deeply connected with doctors in many ways. Chapter 4, “Inventing Reading” explains the history of letters which began on the clay tablets of Sumerians 5000 years ago, Chapter 5, “Learning to Read” explains how children learn to read, and Chapter 6, “The Dyslexic Brain” explains the latest knowledge on the causes, symptoms, and therapies of dyslexia for the general public to understand easily. Most reading scientists including Dehaene know that it is efficient to use the phonics approach rather than the whole language approach when a child first learns letters. However, left-wing politicians expect children to learn letters in their own ways as they read text because it is not democratic for teachers to teach children “a, e, i, o, u.” Also, they present policies that reduce mandatory assignments like dictation or copying advice notes. Korea also introduced the whole language approach from the 7th national curriculum for the so-called Lee Hae-Chan generation, and as a result, mechanical reading and writing education is gradually decreasing. Dehaene claims that if this continues, then the book reading ability of students will easily become insufficient. Chapter 7, “Reading and Symmetry” can be considered as the highlight of this book; it refutes theories that had come up to explain why dyslexics write letters backwards in mirror image, especially the left and right brain dominance theory, and proposes a proper scientific explanation. 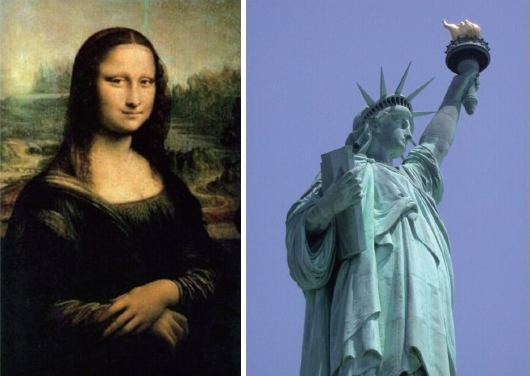 As he shows the photos of Mona Lisa and the Statue of Liberty, he asks the readers if there is anything strange. Actually, the two photos are both reversed, i.e., mirror images of the originals. This way, it reminds you that humans that lived by hunting and gathering did not need to develop the ability to distinguish between a tiger seen from the left and one seen from the right. Therefore, it is claimed that 5- or 6-year-old children have the instinct to treat the original letter and its mirror image as the same; thus, one should be able to unlearn such an instinct to learn letters. Dyslexic children simply are not able to suppress their symmetry instincts yet. The last chapter, Chapter 8, “Toward a Culture of Neurons,” anticipates that with further development of brain science, it would be possible to understand how certain abilities of the brain correspond to each cultural element of language, music, and art, which would explain why humans are the only species with culture. The conclusion is Dehaene’s deep advice for French education policy, but it is not awkward to apply this to our situation as well. Unfortunately, we live in a world where education reform is still primarily a useful electoral platform for policymakers and politicians. Education policies swing back and forth on the whims of school boards. Decisions are often grounded in well-meaning ideologies, but in the absence of rational thought, good intentions are often transformed into largely misguided teaching practices. Left-wing progressives supported the whole-language approach under the pretext that it protects children from the tyranny of decoding and spelling instruction, and that children should be free to learn at their own pace. In a similar vein, some teachers still think that the constraints exercised by our genes and brain structure on learning are “right-wing.” These attitudes do not have much to do with the hard facts about reading acquisition. I cannot accept that the intuitions of school administrators should replace carefully accumulated scientific knowledge.